Is An Alternative To The Israeli–Palestinian Peace Process Having Its Moment? The conversation in Israel has moved past the 2-state nonsense. The discourse now revolves around how much of Judea and Samaria Israel needs to retain in perpetuity. On the Left, Yair Lapid and Michael Oren want to keep maybe 10-20%. 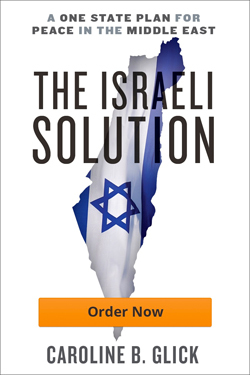 On the Right opinions vary between Naftali Bennett’s plan of applying Israeli law to Area C – around 60% to my plan of applying sovereignty to the entire area. Obviously the question is what happens to the Palestinians. I think we need to be the sole sovereign and that is why I think we must just embrace the whole area. However this pans out, this is a productive discussion. It’s a shame that the American Jewish community hasn’t caught up. Is An Alternative To The Israeli-Palestinian Peace Process Having Its Moment? HERZLIYA, Israel — An alternative plan to end the Israeli–Palestinian conflict proposed by Israel’s former ambassador to the U.S. is having a moment in the spotlight after U.S.-led peace talks broke down last month. Michael Oren, a historian who served as Israel’s U.S. ambassador for four years until late last year, has been advocating what he calls Plan B, a proposal that would have Israel unilaterally withdraw from the occupied West Bank, redraw its borders to include most of the settlers, and end the occupation — all without first negotiating a deal with the Palestinians. Plan B is intended to outmaneuver potential forthcoming Palestinian moves at the United Nations to seek acknowledgment of statehood.